North Antrim MP Ian Paisley spoke in a dairy industry debate in Westminster this week and encouraged the government to increase their efforts to support our local producers. Speaking on Wednesday Mr Paisley raised the issues of how Northern Ireland dairy farmers face even more difficulties than the rest of the UK in what is already a struggling market. The Northern Ireland dairy farming industry is made of almost 3500 farms, with some 2000 people farming nearly 300,000 cows. The price of milk had fallen to 27p per litre, less than the cost of production and is simply unsustainable. There is a significant lack of transparency between the retailer, the processor and the farmer and how prices are set appears to be a real grey area from the farmers perspective. I believe that this will continue to remain the case until more stringent measures are put in place to monitor how these prices are set. Is undoubtedly a significant hidden profit there which the farmer is entitled to a share of, but with regulations as they are, he is prevented from doing so yet the processor continues to prosper. I am asking this government to be more stringent on how prices are set and I am asking them to place restrictions on our supermarkets, who so often use meat and dairy products as their ‘frontline’ when engaged in a price war with any given rival. The Northern Ireland dairy industry currently exports 85% of its produce and are particularly worse off in terms of the price they can get for their produce than the rest of the UK. Indeed this very month our farmers are predicted to earn 5p per litre less than their mainland colleagues and these sorts of margins really can be the difference between whether our farmers keep their heads above water or not. I believe it very important that the government consider the proposal of a tax break for Northern Ireland farmers in order to counteract this shortfall in profits, certainly until a longer term solution can be devised and implemented. I do however believe that it is the responsibility of the entire industry, starting with the government and filtering down through all UK consumers, in particular our supermarket heavyweights, to educate the consumer. It is a fact that the consumer has got to be educated that if they want to eat clean, green, traceable, local produce they are going to be paying more for it. It is a fact, and we’ve got to have all sectors of the industry supporting that fact. Educating the consumer that if they want to fill their basket with local produce, it is going to cost more. We need to get away from this perception that we can have cheap mass quantities of foodstuffs, it will be food ‘like’ stuffs, but it is not the same, and we’ve got to be very clear about that. That is a difficult matter to sell to the public, particularly in times of austerity but I think it is something that we do need to address. There must be pressure put on people to buy red tractor-marked, local goods. This can only be achieved with government support. They must aggressively encourage the sale of those goods and they can take that right to the line. Many European countries break the rules without a second thought when it comes to selling their local products. I want to see our government bending that line and being as pro-active as they possibly can to ensure that as many British products are being sold to British people as possible. Today Ian Paisley MP accompanied by Mervyn Story MLA met with the new CEO of Moy Park Janet McCollum at the Portadown HQ. The MP said, “Poultry production is incredibly important to the Northern Ireland agriculture base and North Antrim farmers make a magnificent contribution to the industry. One of Moy Parks four UK bases is in Ballymena and it is important for me as the Member of Parliament and Agriculture spokesman in Westminster to ensure that this key plant continues to play a leading role in the industry. “Indeed over the next few weeks as we move towards the Christmas fresh turkey production, Ballymena will play a key part in UK production delivering the best fresh turkey to consumers. I want to see this industry flourish. I want to ensure that local farms that need to expand production houses are facilitated with quick and progressive planning approvals and that opportunities to increase business come to all of North Antrim. It is essential that environmental waste issues and the cost of energy is further addressed and solutions found. Much of that falls to others but the impact on the industry is extensive. 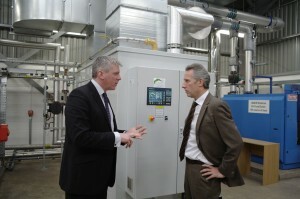 Mr Ian Paisley, MP for North Antrim, visited the Agri-Food and Biosciences Institute (AFBI) Hillsborough in late December 2013. 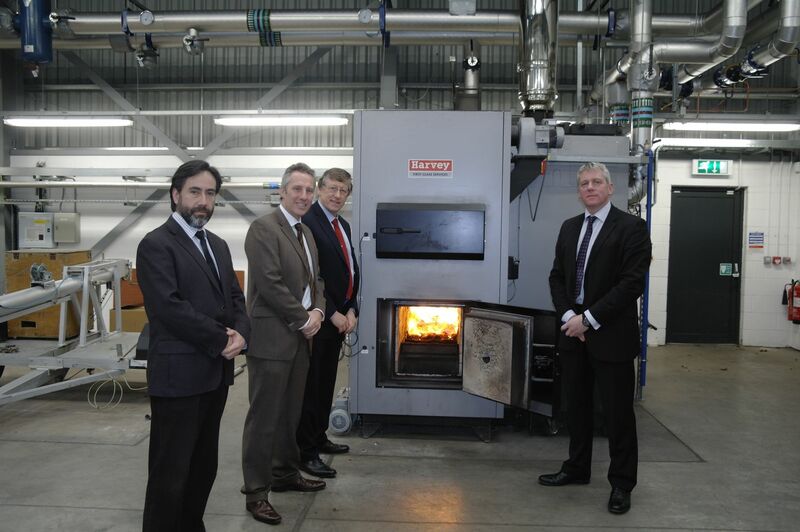 The purpose of his visit was to avail of AFBI expertise regarding the growth potential for biomass energy generation in Northern Ireland. His key objective was to determine the opportunities for local business and employment in this expanding agri-environment sector. Key topics covered during the visit included: agricultural sustainability; climate change; land sourced renewable; and the extent to which the agricultural production of biomass crops had been adopted. With a backdrop of increasing uptake of biomass technology, partially stimulated by Renewable Obligation Certificates and Renewable Heat Initiatives, Mr Paisley’s main concern was where all this biomass would ultimately come from, given the relatively low level of forestation in the province (and indeed across the island). The advice from the AFBI scientists was that a significant quantity of our future biomass requirements for energy generation was expected to come from importation. This was consistent with recent media claims that imports will form a major part of our future biomass requirements in order to “keep the lights on”. Mr Paisley was also very supportive of the concept that local agricultural biomass production would have an important and continuing role for the sustainable supply of biomass for the small to medium scale heat generation. In such systems the quality of the wood chip is very important and AFBI’s research and support for this sector has helped develop short rotation coppice (SRC) willow biomass production and supply chains to increasingly become a more vital part of our energy supply services. 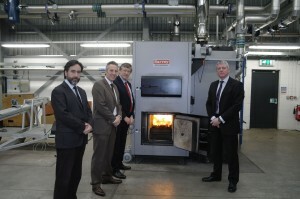 Pictured (l-r) Dr Rodrigo Olave (AFBI senior scientist), Mr Ian Paisley MP, Dr Trevor Gilliland (Head of AFBI Hillsborough), Mr Chris Johnston (Project leader), met at the AFBI Environment & Renewable Energy Centre this week. Mr Paisley was equally eager to promote any opportunities for local businesses to take the lead in the expected need for biomass production outside of Northern Ireland and to capture the profits and benefits of any future importation trade for the local economy. Chris Johnston presented an AFBI vision of a developing bioenergy sector in Northern Ireland with opportunities for the ethical and sustainable production of SRC biomass crops in other countries. In his opinion, such enterprises could benefit both the country of production and Northern Ireland by providing increased fuel security locally and employment opportunities in both countries. Mr Paisley concluded the meeting by stating that AFBI expertise would be pivotal in assisting local entrepreneurs to achieve these objectives. As part of his continuing support for local business interests in this area, he was eager to promote ever closer links between the Renewable Energy Centre at AFBI Hillsborough and the private sector. Ian Paisley MP warns that Government must address the needs of farming community before it is too late. This week in the House of Commons, Ian Paisley the MP for North Antrim sent a warning to Government that the needs of the UK rural community should not be ignored. During the debate concerning the Queen’s speech, Paisley called for more support to farmers to ensure a knock on effect of rising prices is not felt across the whole of the UK. The MP intends to hold further discussions with the Secretary of State for DEFRA Owen Patterson in the coming months surrounding this important issue. “A disaster is coming to our farming community that will dramatically affect the cost of living through the rising cost of food. We have had one of the harshest winters ever. That is affecting and will affect, the price of foodstuffs to feed our cattle and our sheep in the countryside. If next winter is equally harsh, I predict that this time next year the cost of food could be as much as double what it is this year. A bale of hay to feed cattle can cost as much as £60 in Northern Ireland – almost triple last year’s price. That will have a knock-on effect on the cost of living of ordinary households up and down the United Kingdom because it will affect how much a person can purchase to feed their family. “The impact of the cost of living in our rural communities is leading to an increase in suicide. For example, there was a very saddening episode last week in the Republic of Ireland, in County Monaghan, where a farmer shot 40 of his livestock because he could no longer afford to feed them, and then he turned the gun on himself.